The people inhabiting the highly arid zones of South America, such as the Altiplano, have always had to struggle for fresh water. Climate change has the potential toexacerbate this issue. Both Bolivia and Peru are located in zones of water stress and share the resources. Their impoverished populations depend largely on the rivers and lakes fed by glacial melt. The two countries divide Lake Titicaca and its resources evenly through negotiations, benefitting from it both agriculturally and economically. However, while glacial melt will replenish the rising loss of water due to evaporation, the disappearance of Lake Titicaca's surrounding glaciers will leave Bolivia and Peru in a dangerous situation. 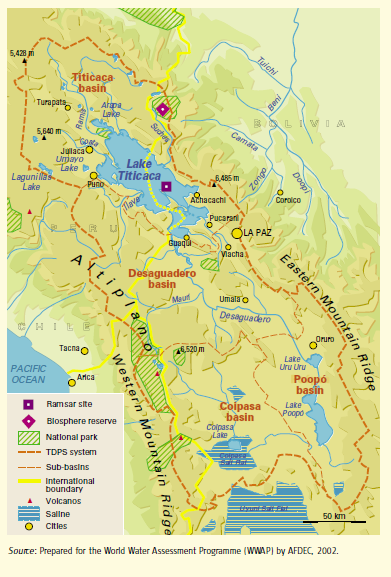 Lake Titicaca is part of a 4 lake basin network known as the TDPS system. It is comprised of the lakes Titicaca, Desaguadero, Poopo and Coipasa salt lake. It is known as the highest navigable lake in the world and is the second largest lake in South America. It is between 3810 meters high above sea level. Its basin has an area of 56300 kilometers squared. (WWAP 466) Lake Titicaca is home to many endangered flora and fauna, and is home to the world’s largest and also critically enangered frog, the telmatobius culeus, or the Titicaca water frog. The lake serves as a source of fresh water for both citizens of Bolivia and Peru. The lake is surrounded by the indigenous populations of the Aymara and the Urus. Lake Titicaca’s freshwater ecosystem is incredibly vulnerable to pollution. 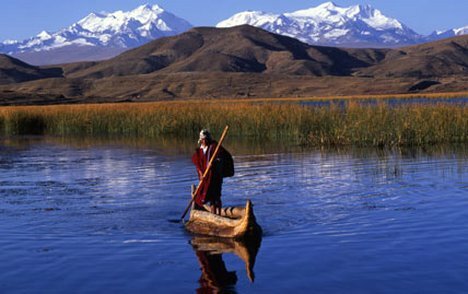 The Aymara and Urus practice traditional lifestyles and depend on the lake for survival (WWAP 147). The lake is situated in the harsh region of the Altiplano. Impoverished communities surround the borders of the lake. Farming and survival in this region is largely dependent on the Lake Titicaca and its resources. The lake's water levels are typically replenished each year from glacial melt. The lake loses much of its water to evaporation due to being at such a high altitude. In fact, the lake loses 90% of its output each year and as a result, the lake depends on yearly and monthly fluctuations of evaporation. (Delclaux et al. 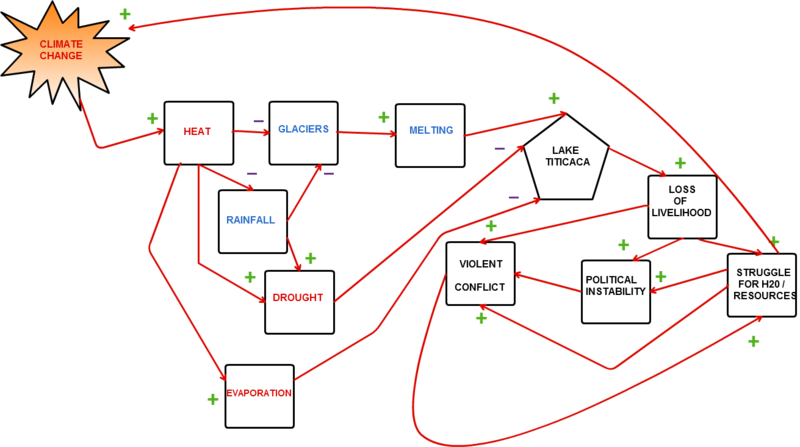 1664) Climate change is exacerbating the amount of evaporation, and this combined with glacial melt could prove disastrous for the joint water governance that Peru and Bolivia have so carefully established. Once the surrounding glaciers have disappeared, Lake Titicaca will have lost a vital part of its yearly recovery. Without the replenishment, the surrounding impoverished communities will overdraft the lake and the water table in an effort to maintain their lifestyles. This will inevitably lead to conflict between the two nations. Water level changes of the Lake Titicaca basin have been well documented as a result of both compiled data and paleoclimatic reconstructions. Francois Delclaux states in his text Evaporation estimation on Lake Titicaca: a synthesis review and modeling that sedimentary core analysis has shown that water levels have fallen by about 100m with respect to the present level between 9000 and 6500 years BP. Evaporation accounts for 90 percent of the lake’s water loss, with 10 percent lost to the Rio Desaguadero (Delclaux 1664). Lake evaporation is usually relatively constant with two maxima and two minima per year. Evaporation estimates vary, ranging from 1350 millimeters per year to 1900 millimeters per year but is averaged at 1500 millimeters per year. This number is extremely high for a lake found in a region with low temperatures. The evaporation levels are a result of air dryness which induces a high vapor pressure deficit. The evaporation is increased by the unusually warm surface temperature of the lake itself. Scientist Jean Pierre Carmouze of the Bolivian branch of the IRD, a French research organization, has proven that were the water temperature the same as the air, evaporation would decrease (Delclaux 1675). However, climate change has begun to affect the TDPS system. High levels of solar radiation have already proven to evaporate larger amounts of water in the TDPS system. Climate change is increasing the amount of solar radiation and heat within the region. This has led to glacial melt and drought, both of which provide consequences for the Lake Titicaca and the people who depend on it. The Lake Titicaca Authority have been monitoring this change and have found that 95 percent of the lake is evaporating per year and this is rising and combined with the melting of the surrounding glaciers and increasing drought, Lake Titicaca is in danger of losing its mechanisms for replenishment. Felix Trujillo chief of Bolivia's National Meteorological and Hydrological Service, is quoted saying that one of the reasons is that the region’s rainy season has been reduced from six to three months (Valdez). Water rationing and other mechanisms have been put in place to conserve water in many nearby Bolivian cities. Climatologist Mark Bush of FIT and a team of researchers studied 370,000 years of Lake Titicaca’s previous climate and showed through their research the possible consequences of climate change. Figure 2 explains part of their findings and shows that Lake Titicaca shrank by as much as 85 percent during two of its interglacial periods and in each case, warming climate led to a migration of vegetation, similar to what is occurring today (Bush 3227-3228). Warmer temperatures cause vegetation to move further upslope. As evaporation increases and the lake’s water levels begin to fall, the lake becomes more saline. Mark Bush’s research can be accessed here. Lake Titicaca is divided evenly between Bolivia and Peru and is mutually governed by both nations under the Autoridad Binacional Autonoma del Systema Hidrico (TDPS) or the Binational Autonomous Authority of Lake Titicaca (ALT). Both countries have an 'exclusive and indivisible joint ownership' over its waters (WWAP). They follow a joint ownership model as a means to ensure management. 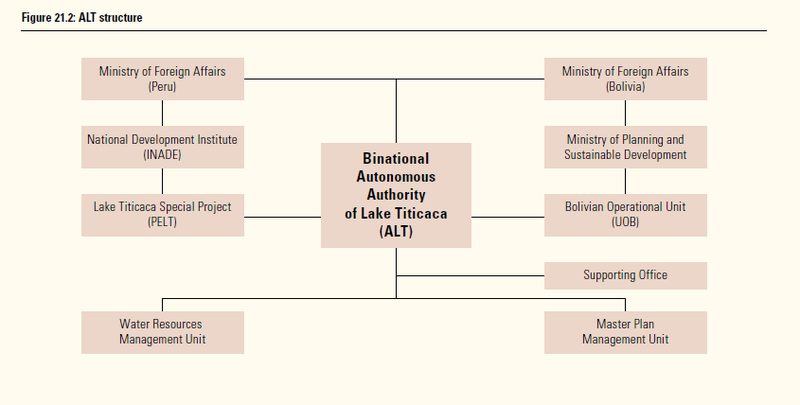 The Ministry of Sustainability and Development in Bolivia and the Peruvian Development Institute also play a large role in governing the lake. There are two projects situated in each country which fall under and depend on the ALT that coordinate the two national governments and centralize information. The two nations share the lake and its resources evenly as is shown in the table below. 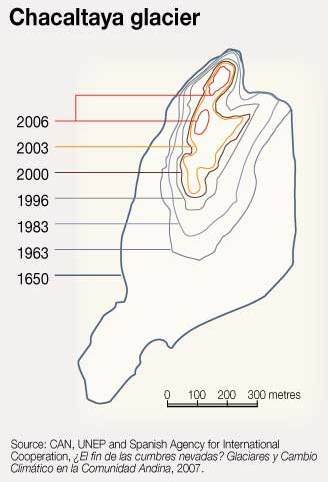 Bolivia lost the Chacaltaya Glacier in as little as 20 years (fig.4). The glacier had completely melted away by 2010. Chacaltaya was once home to one of the world's highest ski runs. An increase in near surface temperature combined with increased El Ni o events which are in essence factors of climate change, have been identified as the primary causes of the recent disappearance of the Chacaltaya Glacier (Francou et al.). Glaciers serve as the main water source for the population living along the Andes and have economic importance as they provide irrigation for farming in the Altiplano and in the desert Pacific coast of Peru. Figure 5 shows the glaciers of the Cordillera Real whose glacial melt help replenish Lake Titicaca's freshwater.The United Nations World Water Assessment Programme has stated that the loss of glaciers such as Chacaltaya “will translate into drought for thousands of people”. Today the glacier is now nothing more than a frigid reminder of what climate change can to do the environment. The disappearance of the Chacaltaya glacier proved how sudden climate change destruction could occur. Lake Titicaca is losing 2-3 centimeters of water per day (Al Jazeera). Climatologist Mark Bush’s findings have predicted the tipping point for Lake Titicaca to be between 2040 and 2050. The tipping point is the point of no return; it is the moment when the lake will no longer be able to recover and will disappear. The tipping point includes a rise in temperature by 1.5 to 2 degrees Celsius above modern temperatures. His calculations were based on the growth limits of Andean forests and on the warming rate of the Peruvian Andes per decade. Therefore, the most serious effects of climate change on Lake Titicaca will be noted over the next 30 to forty years and the end result, the loss of the world’s highest navigable lake, will change the region forever. The TDPS system in which Lake Titicaca is situated is located in the southern part of Peru and the north-west part of Bolivia. Actors include the Bolivian and Peruvian Governments, the Binational Autonomous Authority of Lake Titicaca, the indigenous populations of Bolivia and Peru and International Organizations such as those affiliated with the United Nations. Lake Titicaca is one of several lakes located in the northern end of the Endoheric Altiplano. The Altiplano is a high plateau upon which one finds an irregular climate. Lake Titicaca provides a large moderating influence on the area. The area has zones of diminishing humidity ranging from north to south with varying precipitation. Lake Titicaca is located in a relatively more humid zone, with Lake Poopo in an arid zone and Coipasa Salt Lake in the driest area. The southern, drier part of the system belongs to Bolivia. This issue is a conflict focused on a struggle for resources. Lake Titicaca provides freshwater and economic support via fishing, irrigation, agriculture and tourism for both Bolivia and Peru. The loss of the lake could prove fatal for both economies and drive them to want to overcome the other in order to have what is left of the lake to themselves. The level of conflict is medium as the lake still exists and indigenous populations are still maintaining a traditional lifestyle. This case is primarily speculative, but evidence is clear and supportive of the claim. The indigenous communities are fighting for preservation of the lake and causing civil unrest in major cities as they voice their concerns. Life expectancy of the population around Lake Titicaca's basin is 60.6 years in Peru and 58 in Bolivia. Deaths occur largely in part to malnutrition, infectious, respiratory and gastrointestinal disease and poor water quality. These deaths will skyrocket with the loss of the Titicaca Lake. There will be increased malnutrition and water quality related diseases as well as migratory diseases. These rural populations will seek refuge in the nearby cities and carry disease and infection into the urban centers. As conditions worsen in the rural Lake Titicaca region, urban populations will rise in both countries. (WWAP 467 - 468) Over time, the fatality level will rise however, and peak once Lake Titicaca reaches its tipping point. (Bush et al.) Nearby cities such as La Paz or El Alto could be affected by a lack of water when the lake is gone and populations will both suffer and potentially decrease. Climate change has led to higher levels of solar radiation which has caused glacial melt and decreased rainfall; causing drought. This has led to water loss in the Titicaca Lake which will ultimately cause stress for the indigenous populations inhabiting the region. They will compete and struggle for resources and the final result will be violent conflict amongst the people and aggression between the two nations sharing the resource. Peru and Bolivia have a system in place for governing the shared use and protection of the lake. However, the lake is situated in an area of extreme poverty. Water stress has already led to serious rebellion in Bolivia by the Aymara and Quechua. Extreme cases of poverty can be found on both sides of the lake, Peruvian and Bolivian. According to a joint study by UNESCO and ALT, there are high mortality rates around the lake, mainly in children, high incidence of infection and disease, deficiency in nutrition and poor health. A lack of water would exacerbate these problems and cause a struggle for resources and give rise to rebellion. Without water, farmers cannot irrigate their crops and many would lose their livelihoods. The people would then turn to the governments for aid and cause political instability. Political instability and indigenous conflict would converge and create violent conflict between the two nations in an attempt to seize what little they have left. It is important that we study what is happening and help both nations come up with a plan to address the different scenarios that could happen or may already be happening. This is a vital resource for both countries. 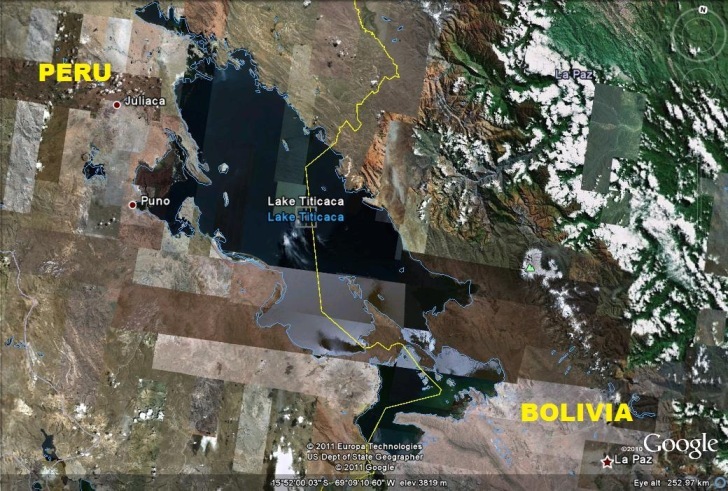 While the relationship between them may currently be amicable, the amount of their population which depends on the lake and the amount of their economic success which depends on the lake (Bolivia especially, as it has no access to oceanic trade) will inevitably lead to conflict. As stated previously, Lake Titicaca is showing signs of decline via increased evaporation and encroaching vegetation. However, the lake has not yet reached its tipping point. Once the lake begins to show drastic signs of shrinkage, the surrounding indigenous population will panic and rebellion will ensue. Recently, thousands of Aymara gathered in the Peruvian city of Puno and initated a complete standstill in the country's main roads demanding they be heard. The indigenous people wished to see the end of a local mining project as well as the cancellation of any exploratory activity in the entire region of Puno, due to the effects it was having on their water supply and due to conflicts with communal lands. (Zecenarro) The ethnic groups inhabiting the TDPS system are many. They are emotional, dedicated and a determined people. They have a history of standing up for what they believe in, even if it means sacrificing their own lives. This recent uprising in Puno lasted nearly two months and six deaths have been associated with the pollution caused by the mining. No deaths have been recorded involving the uprising. This is only a taste of what could occur in the Titicaca region. Fear and survival will push the Aymara and the Urus of the Titicaca Lake to march into Bolivia and Peru and demand the lake be saved or they be compensated for the loss. Climate change will harm not only the ecosystem of the area, but the health of the people and the strength of the governments of Bolivia and Peru. It is imperative that both goverments work on solutions and mitigation strategies, but climate change is happening faster than solutions can be put in place. It is up to the international community to aid in the protection of this region's most precious resource before it is too late. Bolivia, 16." Journal of Geophysical Research 108 (2003): n. pag. Print. 1. Vol. 1. Barcelona: UNESCO , 2003. Print. Valdez, Carlos. "Lake Titicaca shrinking an inch each week." MSNBC. MSN, 13 Nov. Peru?" Latin America Bureau. Oxfam, 18 July 2011. Web. 19 Dec. 2011.